Twitter will start testing increasing its character-limit per tweet to 280 with a small percentage of its users, but only for some languages. This stems from the insight that in languages like Japanese, Korean, and Chinese you can convey about double the amount of information in one character as you can in many other languages, like English, Spanish, Portuguese, or French. 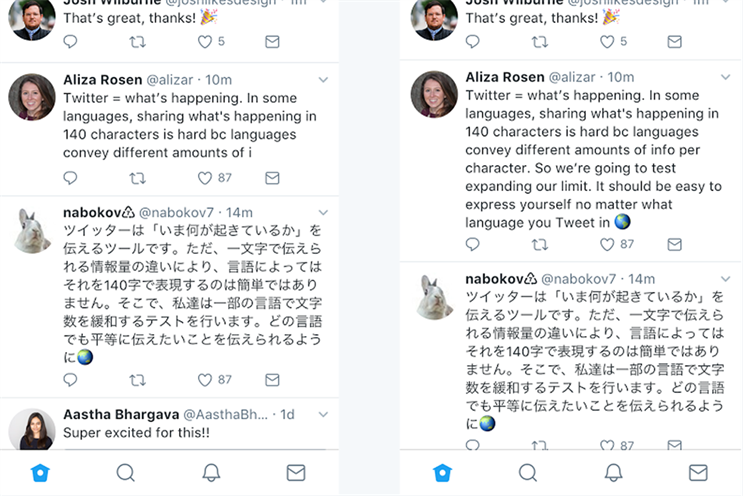 In a joint blog post by Twitter's Aliza Rosen, product manager and Ikuhiro Ihara, senior software engineer, Twitter unveiled that it was testing the 280-character limit on "languages impacted by cramming". Or, every language that is not Japanese, Chinese or Korean. "We want every person around the world to easily express themselves on Twitter," the post said. "Our research shows us that the character limit is a major cause of frustration for people Tweeting in English, but it is not for those Tweeting in Japanese. Also, in all markets, when people don’t have to cram their thoughts into 140 characters and actually have some to spare, we see more people Tweeting – which is awesome!" Twitter also found that only a small percentage of Tweets sent in Japanese have 140 characters (0.4%), but in English it is 9%. Further, most Japanese Tweets are 15 characters while most English Tweets are 34. "Twitter is about brevity. It's what makes it such a great way to see what's happening. Tweets get right to the point with the information or thoughts that matter. That is something we will never change," the post said.